That's how you do a boss fight. The first-person shooters of the 1990s were fast-paced, but Quake seemed faster than anything before it. Truly 3D levels, mouselook, a bouncy regular jump even if you weren't abusing rocket-jumps—it added up to a zippiness that felt powerful and new. Clever level design solved the Sonic problem of having areas full of secrets but a character who only feels good at top speed. There's often one particular key or something you need but there's also a convenient loop back through a section of the level so you can barrel around looking for things you missed, shooting suspicious patches of wall texture or swimming under bridges, during which you naturally find a secret or two before discovering that gold key or whatever. When you hit a boss fight it still doesn't slow down. Chthon emerges from the lava and instead of standing in one spot shooting away at his health bar you keep moving, racing his fireballs to flip switches just like you do when looping through an ordinary level, only now you're lowering pylons into position then electrocuting the big jerkbag of an elder god. 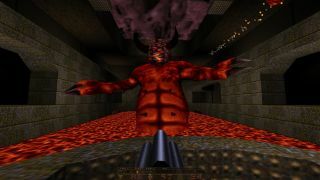 There are plenty of other things about Quake to celebrate, like the soundtrack and the multiplayer and the mods, but let's not forget Chthon. Fighting him sets you up for the finale, which is another puzzle boss who can't be shot, and it's also a great capstone for the playstyle it's taught you. And then at the end of the level when it's tallying your score and number of secrets you get to see Chthon's gibs squirting all over the screen. Quake knew what we wanted and it delivered.